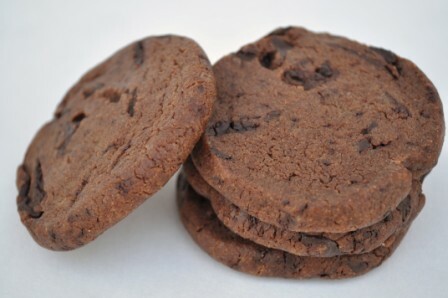 The Dark Chocolate Lover’s Cookie. Can world peace be achieved? 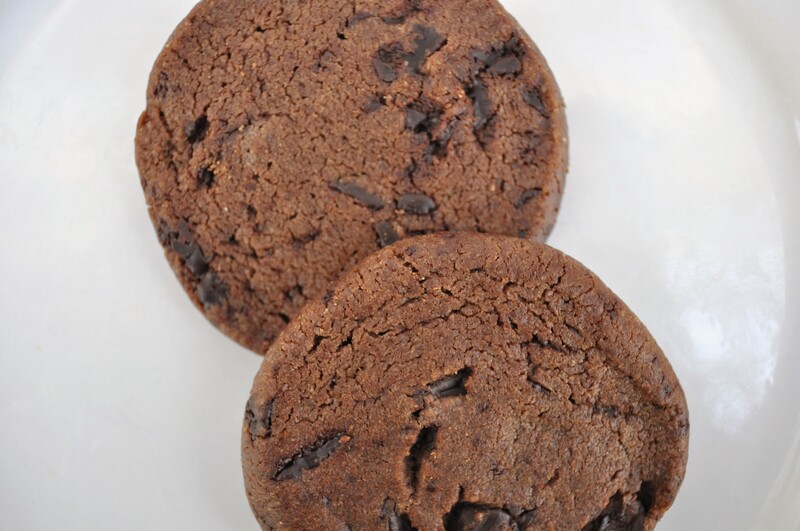 The richness in these chocolate sable World Peace Cookies may very well make this happen. They are perfectly buttery with a sandy texture and divine bits of bittersweet chocolate. World Peace Cookies are fantastic with a tall glass of milk. Served warm, these cookies are like melt-in-your-mouth heaven; served at room temperature, the texture of these crumbly cookies offer a nice contrast to its chocolate bits. Dorie Greenspan’s recipe is excellent and simply perfect. For those of you who may not have a stand mixer or a hand mixer (or just don’t want to clean another appliance), try this recipe with a fork. One bite of these cookies and you will not stop. Sift flour, cocoa powder and baking soda. If you do not have a flour sifter, place the ingredients in a bowl and mix thoroughly. In a separate bowl, mix butter with a fork until soft and creamy. Add granulated sugar, brown sugar, salt and vanilla. Mix until incorporated with butter. 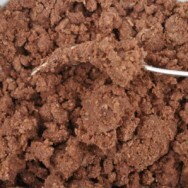 Add dry mixture and mix until it disappears into the dough and moist clumps form. 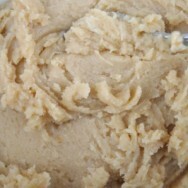 For the best texture, work the dough as little as possible once the dry mixture is added. 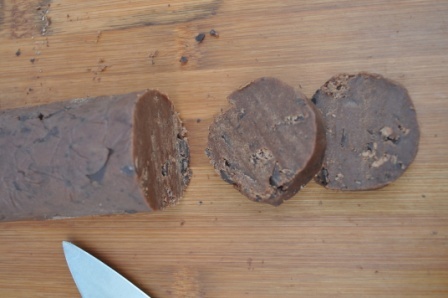 Fold in chocolate to incorporate until dough forms. Divide dough into 2 equal parts and place onto a work surface. Shape each dough into 1 1/2″ diameter logs. Make sure that each log is tightly rolled and compact. Wrap each log in plastic wrap. Chill in refrigerator for at least 1 hour. Remove logs from refrigerator and unwrap plastic wrap. Place logs on a cutting board. Using a sharp and sturdy knife, cut logs into 1/2″ thick slices. If slices break apart, use your hands to tighten and reshape them into rounds. Arrange rounds onto lined baking sheet 1″ apart. Bake cookies one sheet at a time for 12 minutes. Cookies will not look like they are cooked nor will they be firm. But that’s how they are suppose to look as the tops may begin to barely crack. Remove the cookies from the oven and allow to set and cool on the baking sheet. The cookies can be served warm or at room temperature. If you serve the cookies warm, be careful not to remove them too early from the baking sheet otherwise they will fall apart. Yes, a little restraint is required but it’s worth it! Notes: This recipe is adapted for basic utensils (i.e. fork and bowls) and excludes the use of a stand mixer or hand mixer. Also the logs can be refrigerated for up to 3 days or frozen for up to 2 months. If frozen, just slice then bake rounds for an additional 1-2 minutes. 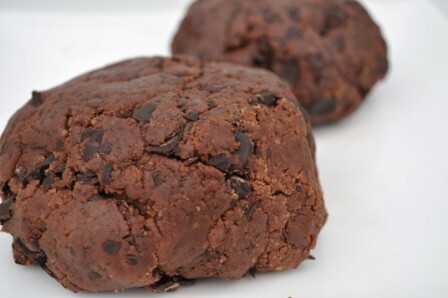 Ingredient Recommendation: 72% dark chocolate is wonderful for the chocolate bits in these cookies. 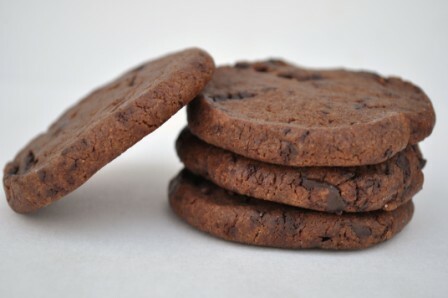 Storage Tip: Packed airtight these cookies will keep at room temperature for up to 3 days; and frozen for up to 2 months.